As David Letterman says goodbye to the Late Show this week, let's rewind back to the '80s (when the show was called Late Night) and rediscover some of his classic bits. His childish and absurd segments in his early years were the foundation of the 6 Emmy awards the show received in the '90s. Velcro Suit - Dave meets a bonafide Velcro USA executive and shows the power of velcro. 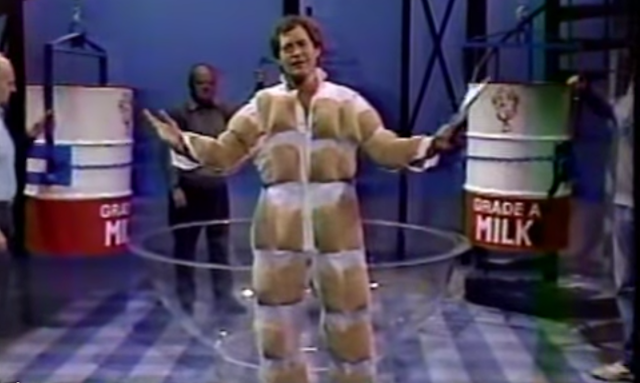 Human Sponge Suit - Dave does his best Incredible Hulk impression using a sponge suit. Using a scale, Dave finds he's gained a little weight and checks in at over 500 pounds. Alka Seltzer Suit - Dave dons a suit with 3,400 Alka Seltzer tablets attached and gets dunked in a tank of water to see what happens. Magnet Suit - Paul Shaffer helps Dave conduct some experiments with a suit of magnets. The finale has Dave trying to stick to a large GE refrigerator. Potato Chip Suit - Dave uses a potato chip suit and 1,900 pounds of dip to create the world's largest snack for the audience. Rice Krispies Suit - This attempt to break the sound barrier includes a suit filled with Rice Krispies cereal and 150 gallons of milk. Fire Suit of Marshmallows - Dave uses a fire resistant suit with 500 marshmallows to create a toasted snack for the audience.